“My wines are a reflection of my personality”……. So muses Alessandro Mori, winemaker and proprietor at Il Marroneto. To those who have spent time with him, you can clearly understand his meaning. Alessandro can be reserved initially, a trait that almost seems to portend aloofness. However, as he eases into the discussion, perhaps even as the wine begins to flow, he becomes more relaxed and charming. This is easily mirrored in his flagship behemoth of a Brunello; the Madonna delle Grazie. 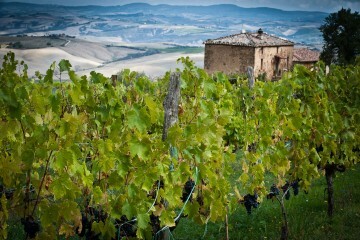 The Il Marroneto Estate sits in the northern part of the Brunello zone not far from the walls of Montalcino. At elevations of 350-400 meters above sea level, Il Marroneto’s vineyards are some of the highest in the DOCG. As of 1979, there were just over 6,000 meters (2/3 of an acre) of vineyards. This was expanded by 2 more acres in 1984. The estate was purchased by the current owner’s Father in 1974 and shortly thereafter, Alessandro took the reins of the estate and began elevating its production to the current status. 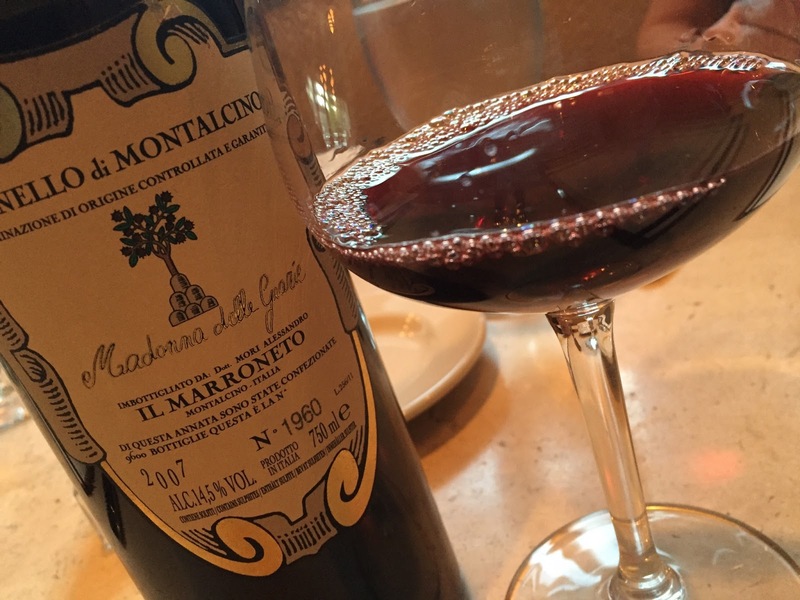 Today, we’re focusing on one of the flagship Brunello from not only Il Marroneto, but from Montalcino; the 2007 Madonna delle Grazie. Three years ago, the 2007 was a slumbering giant – quite unhappy to be awakened. Happily, this tasting has yielded a different wine altogether. We decanted the wine for 60 minutes to remove a fine coffee grind like sediment and to prepare for what may have been a reticent Brunello. We then took the wine to a local Bistro and paired it with braised short ribs over gorgonzola polenta. Perfetto! In the glass, the wine is a deep ruby red and the trademark copper rim of Brunello is starting to materialize. On the nose, the wine is classically attributed. There are notes of crushed red cherry, porcini mushroom, sweet tobacco, fennel and chestnut. It is complex and gorgeous to take in. On the palate, the wine is largely scaled for sure, but it’s way more opulent and expressive than it was three years ago. Rich flavors of wild berry, tobacco, mushroom, warmed clay and fennel are concentrated and ripe. The acidity is fresh, and helps wash what are still substantial tannins from your palate. With the short ribs, the wine was tamer and more plump. I believe this still has a long life ahead of it but if you’re enjoying it with excellent food (and why wouldn’t you?) then this is in a perfect place right now. 96 points. About $75. Good stuff from Tuscan Vines. Brunello producer IL Marronetto. Hey Bob! Thanks, and thanks for checking in. Joe, I'm confident you'll be happy with both of those; the 2008 will just drinker sooner and not last as long. The 2011 will be part of my upcoming Brunello report on that vintage, but I haven't tasted it yet.